Hey guys! Over the past few weeks I’ve picked up a couple of things from New Look, it’s hard not to pop in, especially when you work there! I didn’t get too much, I feel like I see the clothes way too much and get sick of them easily but this seasons current collection is so nice so I couldn’t resist! 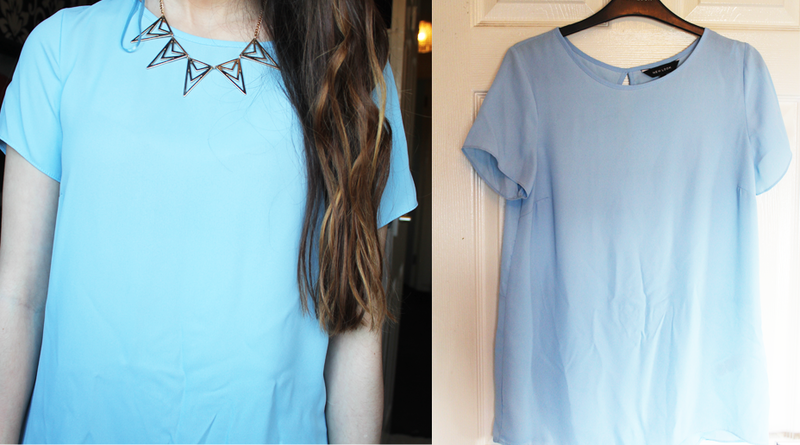 The first thing I got was this baby blue, chiffon top, which I fell in love with. My only problem is that it’s a little long for me, I’m between a size 8-10 and got this in an 8 and it’s still extremely long. I think it’s the style of the top, although I don’t really like tops this long I couldn’t not buy it. It does look good with leggings and a statement necklace though, the one I’m wearing in this photo is from Topshop. You can find this top here for 14.99! 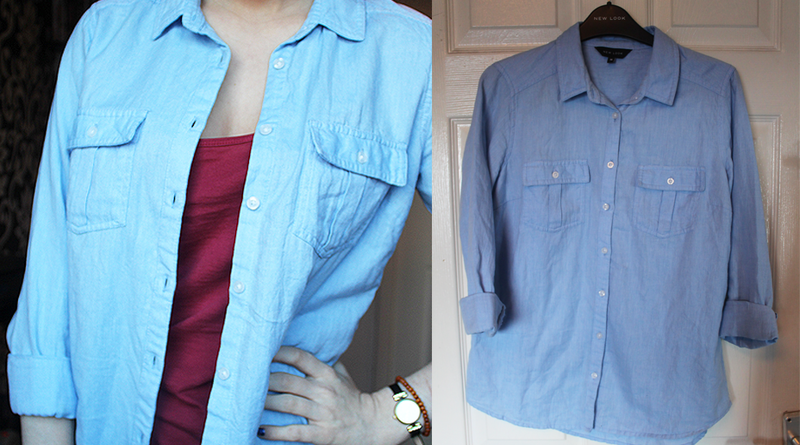 The next shirt I got is a cotton, denim type button up shirt – they’re my favourite kind of shirts. It’s definitely one of my favourites, and I was inspired by Amy Raudenfeld for this shirt. It’s not exactly the same but it reminded me of it. I got this shirt in a size 10, there weren’t any 8’s at the time but I really wanted it. You can get this here for 14.99! 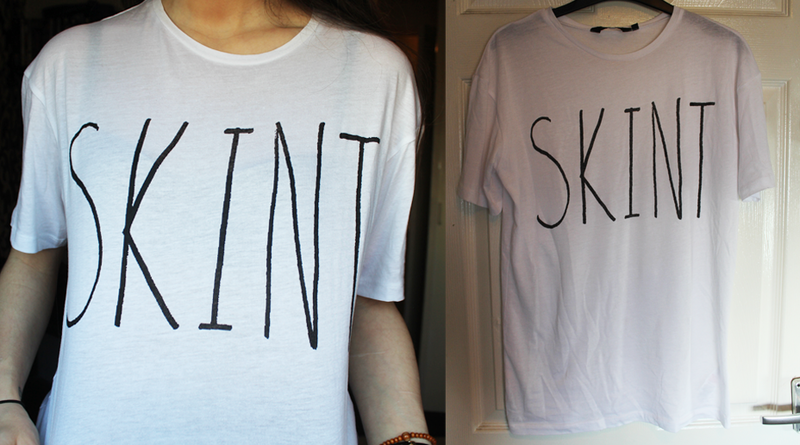 I then picked up this t-shirt, which is a basic white t-shirt with the slogan ‘SKINT’ on it, which sums me up perfectly considering how much money I don’t have (yet continue to buy clothes). I thought this would be cute just to wear with leggings/lounge about in. I did get this in a size 10 at first but it was way too big so got it in a size 8, it’s still a little baggy but I don’t like tight fitting shirts either. I got it for 6.99 and you can get it here. 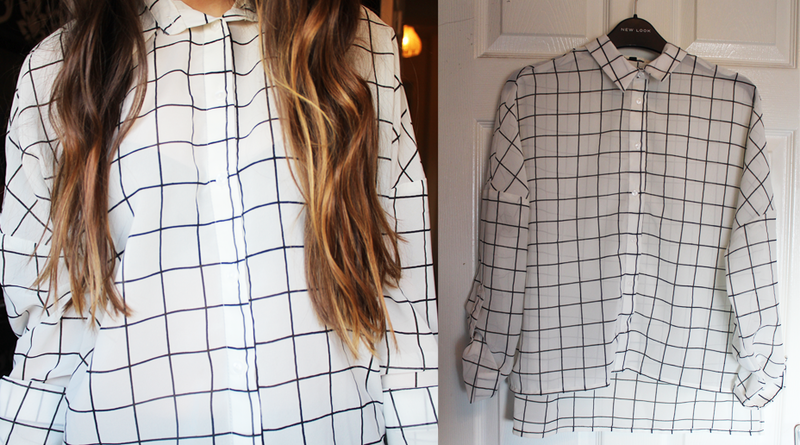 The last thing that I picked up just this week is this grid print boxxy chiffon shirt, I haven’t worn this yet and I’m still a bit unsure if I like the fit on me but I absolutely love grid print. I got this in a size 8 also, again I did get a 10 at first but it was really baggy. The 8 still seems slightly baggy, but I do like the shirt. This was 19.99 and you can get it here. And that’s everything that I picked up recently, let me know what your favourite thing was! I’ll try and post every couple of days so feel free to leave any comments/suggestions too!